Kingdom Singhasari or often also written Singasari, is a kingdom in East Java, which was founded by Ken Arok in the year 1222. Location kingdom is now estimated to be in the area Singosari, Malang. Tumapel originally only a subordinate kingdom of Kadiri area. Who served as akuwu (equivalent camat) Tumapel that time is Tunggul Ametung. He died were killed by an underhand pengawalnya own named Ken Arok, who then became the new akuwu. Not only that, even Ken Arok intends Tumapel deliver power from Kadiri. In the year 1222 of enmity between the king of Kadiri Kertajaya against the Brahmin. The Brahmin ago confederate with Ken Arok that the king himself became the first Sri Tumapel title Rajasa Amurwabhumi Sang. Kadiri against war erupt in the village Ganter won by parties Tumapel. 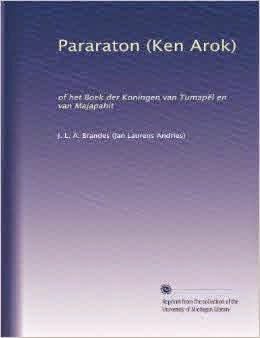 Nagarakretagama also mentions the same year to establish the Kingdom of Tumapel, but does not mention the name of Ken Arok. In the script, the founder of the kingdom called Tumapel Ranggah Rajasa Girinathaputra the successful defeat of the king Kertajaya Kadiri. At Malurung inscription in the name of Kertanagara year 1255, said that the founder of the Kingdom of Tumapel Bhatara is Siwa. Perhaps this is the name of a degree posthumously Ranggah Rajasa, because Nagarakretagama in the spirit of the kingdom is glorified as Tumapel Siwa. In addition, Pararaton also mentioned that, before the advance of war against Kadiri, Ken Arok first use nicknames Bhatara Siwa. Founder of the Kingdom of Singasari is Ken Arok who became king with the title of Sri Ranggah Singasari Rajasa The Amurwabumi. The emergence of Ken Arok as the first king Singasari mark the emergence of a new dynasty, the dynasty Rajasa (Rajasawangsa) or Girindra (Girindrawangsa). Ranggawuni Singasari Kingdom throne in 1248 with a degree in Sri Jaya Wisnuwardana by Mahesa Cempaka (son of Mahesa Wongateleng) which was given the position as queen angabhaya with Narasinghamurti title. Ppemerintahan Ranggawuni bring peace and prosperity of the people Singasari. In 1254, Wisnuwardana raised her son by the name Kertanegara as yuwaraja (viceroy) in order to prepare a great king in the Kingdom Singasari. In 1268 Wisnuwardanameninggal world and didharmakan in Jajaghu or Jago Temple and the Temple Buddhist Amogapasa Waleri as Shiva. In addition to mastering Malay, also conquered Singasari Pahang, Sundanese, Balinese, Bakulapura (West Kalimantan), and Desert (Maluku). Kertanegara also maintains friendly relations with the king of Champa, in order to retain power perluasaan Kublai Khan of the Mongol Dynasty. Kertanegara refused to injure nuka envoy named Mengki. Kertanegara act of Kublai Khan made a big upset and intends to punish by sending troops into Java. Kertanaga and palace chiefs were killed in the attack. The assistance Aria Wiraraja, Raden Wijaya get forgiveness and to serve the Jayakatwang. With the death of the Kingdom of Singasari Kertanegara controlled by Jayakatwang. In accordance with their religion and Kertanegara then didharmakan as Shiva - Buddha (Bairawa) at Temple Singasari. 0 Response to "History Of Singasari Kingdom"